Still recovering from the first day of continuous eating at hole-in-the-wall gems in Richmond, we met up at Happy Date for some breakfast. 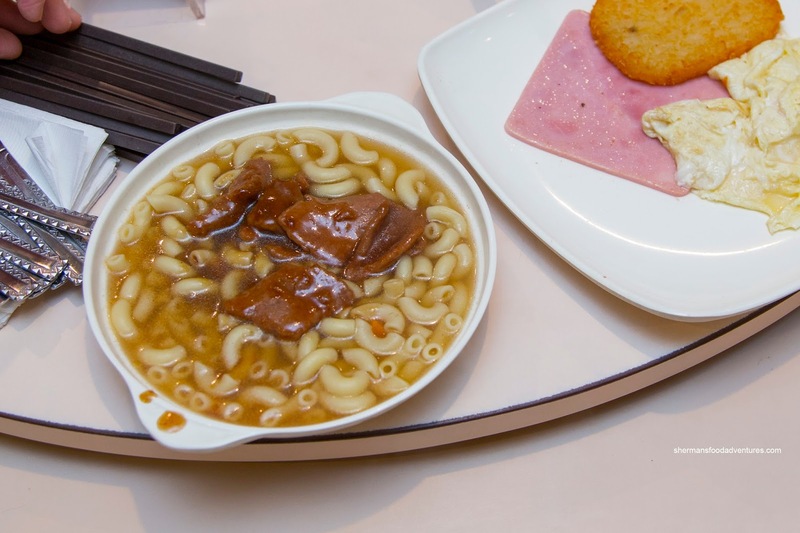 The place is known as a quintessential Hong Kong-style cafe offering both traditional Chinese and Western favourites with an Asian twist. Case in point, our first combo featured Scambled Eggs, Ham and Hashbrown that came with a side of Macaroni with Beef in Soup. Yep, a greasy spoon type of breaky with some pasta in an Chinese broth (chicken) with tenderized and stir-fried beef. Fusion or confusion? No one really knows, but it is inexpensive and does the job was quite tasty. 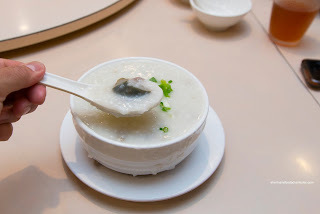 We moved onto a more traditional Chinese day-starter in the Preserved Egg & Salted Pork Congee. This was thick while still sporting bits of soft rice. It remained as such all the way to the last spoonful. I thought it was mildly seasoned where it wasn't devoid of flavour while not salty either. There was plenty of preserved egg to go around and the shredded pork was moist and lightly salty. We also got the HK-Style Congee and it sported a background seafood flavour due to the ingredients. I found the shrimp to be overdone though. 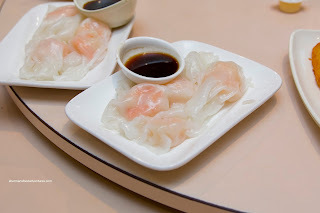 That wasn't a issue with the Shrimp Rice Noodle Roll as they had a buttery snap. The rice noodle itself was firm and chewy (but not in a bad way). 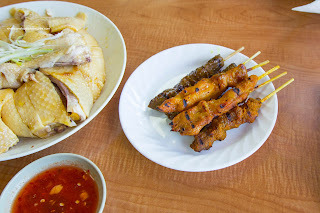 From our "breakfast", we went directly to lunch at Prata-Man. I remember visiting the place in the early 90's and even after an ownership change, the chicken remains a great value. 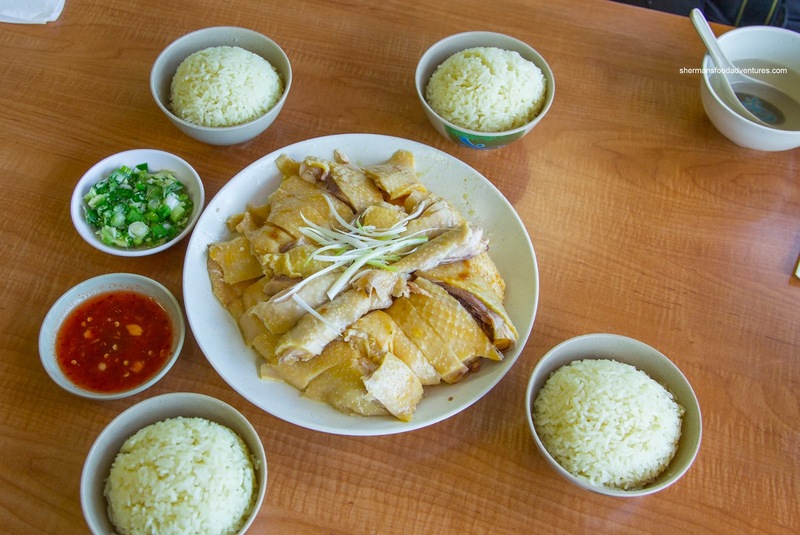 Their specialty is Hainanese Chicken, which is essentially poached chicken (barely cooked), deboned and served with soup, chicken oil rice, sweet chili sauce and ginger & green onion condiment. We ended up with a free-range chicken (pre-order) and it featured more a robust meat that was still tender and succulent. The chicken oil rice was nutty and well-seasoned helping to bring the whole meal together. We also got a side of their wonderful Satay (in beef, chicken and pork). These were nicely charred being caramelized and smoky. Although the meat was well-done, it remained tender. 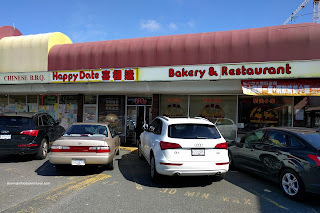 Leaving Prata-Man, we headed over to R&H Chinese Cuisine at Landsdowne Mall for a "snack". We got one each of their made-to-order Xiao Long Bao and Boiled Pork & Green Onion Dumplings. I've already had these several times and for the price and venue, these XLBs were solid. Except for a doughy top twist, the rest of the dumpling wrapper was thin sporting an appealing elasticity. Inside, the pork filling was tender and soft. Best of all, there was a considerable amount of soup that was well-balanced. 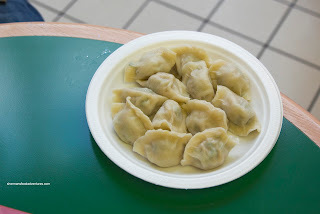 Not to be outdone, the boiled dumplings featured a surprising amount of soup as well. Hence, the meat was succulent and moist with a brightness provided by the green onion. 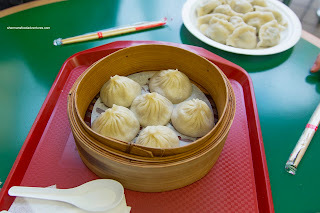 I found the dumpling skin to be just thick enough that it didn't overwhelm the meat filling. 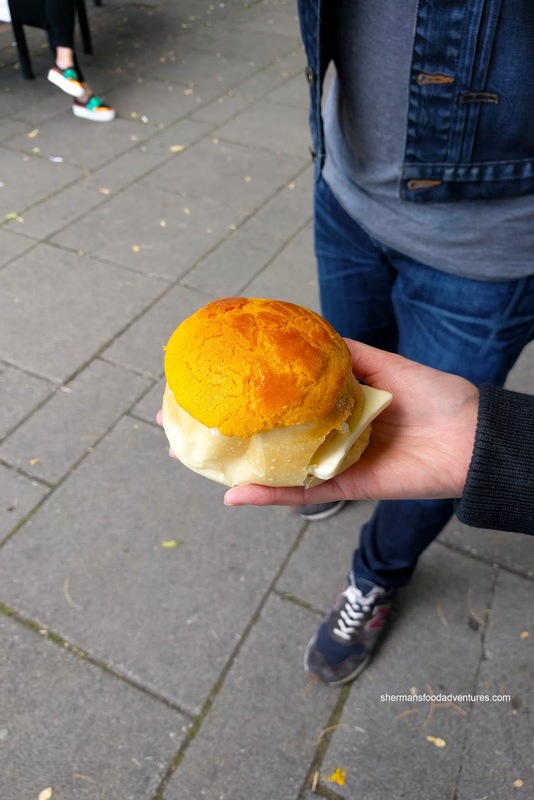 We couldn't do a hole-in-the-wall food tour of Richmond without chowing down on the infamous Pineapple Bun with a thick slice of cold butter at Lido. These are continuously baked fresh during the day and sell out almost immediately. We had to wait 10 minutes for ours and of course they were well worth it. Soft with a light elasticity, the bun was warm and pillowy soft. The top crispy sweet layer of buttery goodness added just the right amount of texture and flavour. However, the contrasting slice of cold butter was the literal icing on the cake providing a creamy saltiness. While still packing down the pineapple bun, we made our way to the nearby Parker Place to experience the "other" superstar Chinese BBQ in Richmond. This was a great way to compare with HK BBQ Master from the day before. We got a bit of Roast Pork and BBQ Duck to share. 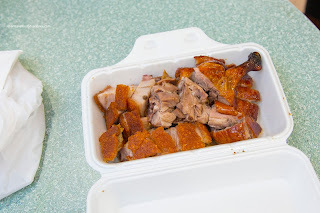 With a more uniformly golden hue and surface texture, the pork crackling was also crunchier and firmer than the airy chicharron-type found at HK BBQ Master. Meat was also more lean since they employ the whole hog rather than just the belly. Unlike the results of the Chinese Restaurant Awards, we found the BBQ duck to be less flavourful with softer skin than the one found at HK BBQ Master. But that is like splitting hairs as it was still very good. 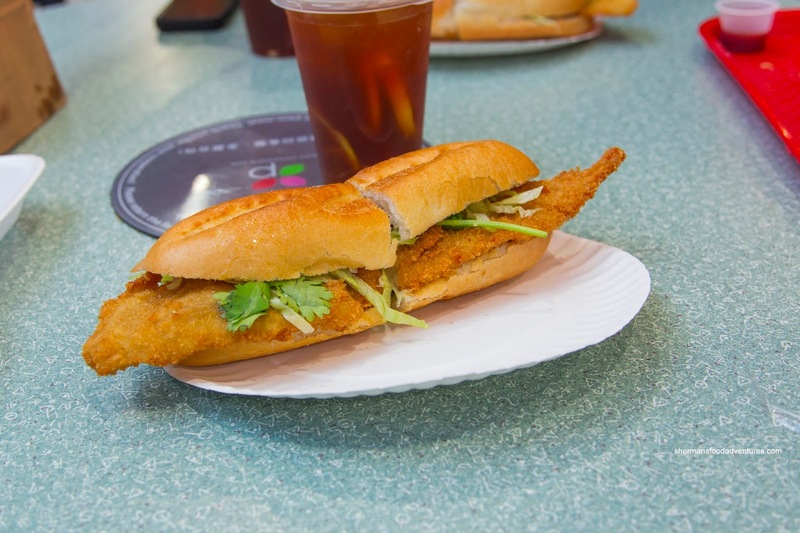 Trying to avoid falling asleep due to my food coma, we waddled over to Lai Taste in the food court to sample their Fried Fish Banh Mi featuring a fbasa filet, cucumber, lettuce, cilantro and buttery mayo in a baguette. This huge sandwich coupled with a drink cost only $4.75! Value aside, this was also fantastic with a crunchy exterior giving way to flaky and moist fish. Loved the airy and crusty baguette as it didn't get in the way of the delicate fish. A few splashes of sriracha really kicked things up a notch. Suffice to say, it was hard to eat everything that was thrown at us, but we did anyways (did you expect any less???). Now we just had to wait another 3 hours until our next feed.